JKS is pleased to introduce the new “SBS System” for the Jeep® Cherokee. The “SBS” stands for Steering Brace System, which is only part of the function of this ultimate brace kit. 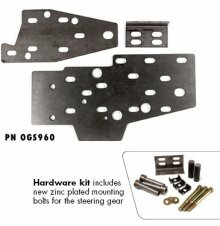 This kit also provides new tow hook and bumper/winch mounts that are much stronger than the stock configuration. This product was originally designed and perfected by Mark Hinkley. He did all research and product evaluation. Mr. Hinkley has gathered the following information from years of experience with the Cherokee. Obviously we concur with all of his findings and have made no changes to the original design. 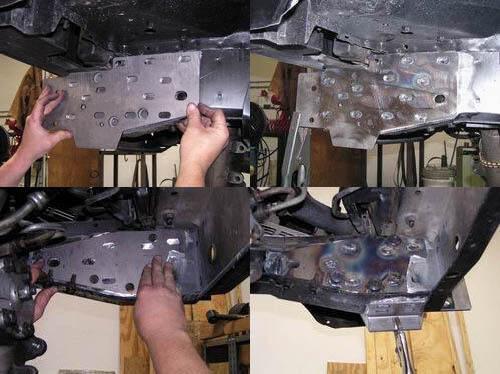 Frame failures around the XJ steering box are more common than one might think. The frame area that the steering box is mounted is made from various layers of sheet metal and is held together mainly by spot welds. Although spot welding this area is common in the OEM world, it does not stand up to the extreme stresses of large tires and/or off-roading. These spot welds quickly fail allowing cracks to develop because of the excessive movement between the inner and outer frame. Tying the inner and outer frame together in a more substantial way is the only cure to the problem. Another problem is the spacer/sleeve, which holds the steering box away from the frame. It is made from some type of cheap “pot metal”. This “pot metal” corrodes quickly and corrodes itself to the bolt. When you try to tighten this bolt, it won’t budge so you automatically think it is tight, when really it is simply corroded to the spacer. This either leaves a loose steering box or an over-stressed bolt. Either way, the bolt will most likely snap off in the most inopportune time. Lastly, it is very important to make sure if you do any type of winching via the front bumper that you tie that bumper into the large holes provided by Jeep®. Using these mounting holes will spread the load on the uni-body. Also, the tow hooks can now be mounted sideways (not pointing downward), a nice feature that keeps them from hanging up on obstacles.